"That's the spirit � one part brave, three parts fool." The highly popular novel Eragon is most noteworthy for the extremely young age of its author, who began writing it at the age of fifteen. Christopher Paolini was home-schooled by his parents in Montana, and wrote the fantasy story after finishing high school three years early. Opinions on the book and its follow-up Eldest are highly mixed, ranging from tremendous praise to nasty charges of being derivative to Star Wars and The Lord of the Rings novels. I have not read Paolini's books, but have noticed many similarities between this tale and those famous epics. Does the film adaptation overcome these obstacles and provide an original experience? The movie Eragon earned a big push on its December opening weekend from devoted fans clamoring to see the story on screen. However, their scathing response to significant changes helped to doom the picture. I have minimal knowledge of the book, but agree that the film offers a disappointing experience. Its brief running time allows for little connection with the characters, who are driven by the plot instead of actual motivations. The primary fault rests with Peter Buchman's (Jurassic Park III) screenplay, which simplifies the events to their most basic form and offers few interesting scenes. This story does feel eerily similar to Star Wars, with an innocent farmboy realizing that he faces a great destiny. He also has an older guide like Obi-Wan Kenobi who fought in the past and must rescue a beautiful girl from a difficult fortress. The conclusion also recalls the Battle of Helm's Deep from The Lord of the Rings: The Two Towers with a gigantic evil army invading the heroes' fortress. There are numerous other comparisons possible, but I believe you get the idea. The basic story centers on Eragon (Edward Speleers)�a 17-year-old farm boy who discovers a mysterious stone while hunting in the woods. This object turns out to be the egg of the dragon Saphira (voiced by Rachel Weisz), whose presence brings hope to the world. The citizens face the tyrannical rule of King Galbatorix (John Malkovich), and young men are conscripted into his army when they reach adulthood. 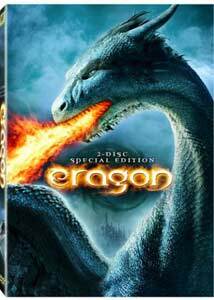 Eragon's situation changes drastically by meeting Saphira, which causes the evil forces to threaten his life. He also meets the grizzled warrior Brom (Jeremy Irons), who knows plenty about the past and Eragon's destiny. After a sad event, they begin a journey to find the rebellious warriors that could help them defeat the king. Hot on their trail are the minions of the evil shade Durza (Robert Carlyle), who aims to eliminate them by any possible means. It's unbelievable that a story this bland could receive a $100 million budget, but the success of similar franchises must have caused 20th Century Fox to expect a big payday. Unfortunately, this film presents an all-too-familiar story that pales in comparison to recent fantasy classics. Speleer struggles to generate believable emotions in the lead role and performs like a first-time movie actor. Irons deserves credit for his understated work, but he's trapped in a conventional storyline. Brom must deliver considerable exposition, which is rarely positive, but Irons' presence helps considerably. On the other hand, Malkovich appears in only a few scenes and does little but chew up scenery. His talents are completely wasted in a role that's been seen countless times. We also catch a quick glimpse of Djimon Hounsou (Blood Diamond) near the finale, which I assume is a set-up for a larger role in a sequel. One of the least-interesting characters is Garrett Hedlund's Murtagh, who I'm hoping was a more complex figure in the book. His role here is a total cliche and also probably suffered from some serious cuts. Eragon marks the directorial debut of Stefan Fangmeier, who has earned numerous accolades as the visual effects supervisor of memorable films like Saving Private Ryan and The Perfect Storm. His technical skills are acceptable, but the filming style fails to generate any compassion. The early family moments are so awkward that we can only hope for the plot to start moving. The desire for something exciting to happen remains throughout the film, even during the major battle. This sequence offers awkward, quick edits that make it nearly impossible to understand the action. Scenes with Durza rallying his army feel directly aped from the Lord of the Rings series, so the supposed buildup accomplishes little. Fangmeier undoubtedly has tremendous skills to create visual effects, but his direction adds little to an extremely bland script. The short running time may be a relief to frustrated viewers, but it also limits the overall scope and supports a made-for-television atmosphere that dooms the entire picture. Image Transfer Review: The many computer-generated images of Eragon require a top-notch transfer, and the 2.35:1 anamorphic widescreen transfer fails to disappoint. While this picture lacks the grand scope of the best epics, the outdoor scenery does offer some impressive sights. The bright colors assist in creating a majestic atmosphere, and the images remain sharp throughout the feature. There are a lot of nighttime scenes, but they avoid the grainy look often prevalent during these moments. Audio Transfer Review: This release offers an excellent DTS transfer that immerses the viewer into the final battle. Of course, the awkward quick cutting lessens the effect, but the fault does not lie with the transfer. There's also a 5.1-channel Dolby Digital option which is slightly less worthy but still provides entertaining audio. Both tracks utilize the rear speakers effectively and enhance the overall presentation. Director Stefan Fangmeier is an expert on visual effects, and he offers some worthy insights on their creation during his feature-length commentary. His enthusiasm remains high throughout the film, but he spends way too much time summarizing the plot. Some information is worthwhile amid the obvious statements, and it's mildly interesting. However, Fangmeier misses a valuable opportunity to explain the creative process of adapting a highly popular novel. The next six segments are part of Inside the Inheritance Trilogy: The Magic of Eragon, which can be viewed as a lengthy documentary or shorter featurettes. This brief opener introduces the author Christopher Paolini, who looks extremely young, even for a 23-year-old. However, his appearance does correspond with my impressions of the fantasy writer. Fangmeier also provides quick comments about his first picture, and Screenwriter Peter Buchman discusses his need to know plot points from future books to craft this script. This entry offers a quick look at the early concepts and set construction. Fangmeier describes how he used the descriptions in the novel as the starting point for the visual style. We also learn about the shooting choice of Hungary, which offered the "organic" environment desired by the director. This typical casting feature begins by covering the tough search for Eragon, which involved numerous actors. They hoped to find an innocent guy with little experience, and Ed Speleers matched these requirements. We also hear from Jeremy Irons, who enjoyed worked with Ed because he was a similar age to his own son. Other topics include Sienna Guillory's horseback riding skills, the visual concepts for Robert Carlyle's Durza, and the choice of John Malkovich for Galbatorix. The centerpiece of the documentary is this behind-the-scenes segment, which displays production footage from several pivotal sequences. The piece begins on location at the farm for the first day of shooting, which involves the playful fight between Eragon and Roran. We also view the creation of the ring of fire, the stunts involved with the fighting sequences, the interior set at Durza's fortress, and the brutal shooting of the final battle. Fangmeier does a good job presenting the decisions involved in the creative process while remaining extremely positive. Visual Effects Supervisor Samir Hoon begins this segment by describing the creation of the dragon. We also hear from Animation Supervisor Glen Macintosh and view shots of flying tests, design changes, and the tough decisions involved. Another interesting area involves the crazy rig used to simulate dragon flight for Speleer. It looks extremely uncomfortable and strenuous, but does the job. The brief conclusion to the documentary includes speculation from Fangmeier about the third book and comments from Paolini about his hopes as the author. The remaining time involves cheesy music matched to shots of the film's locations and characters. This section presents the complete text for the first two chapters of Paolini's follow-up novel�Eldest. While this is a worthy feature, the story addresses plotlines excised from the film and may confuse viewers who have not read the original book. This group of six brief featurettes describes the major characters and the actors who played them. We discover more details about the Dragon Riders (Eragon, Brom, and Galbatorix), Saphira, Arya, Durza, the Urgals, and the Razac. Fangmeier does address the controversy of removing the horns from the Urgals and making them ugly humans, but his reasons are not very convincing. The Razac section contains some great concept art, which is always a worthy inclusion in this type of film. Located under the Vision of Aragon section, this collection of drawings comes from Fangmeier's original presentation to 20th Century Fox. The images contain interesting details and are fairly accurate when compared to the completed film. You have the option of listening to Fangmeier's commentary, which describes the creation and use of this feature. Also housed in the Vision of Eragon area, this sequence includes shots of Fangmeier's 20th Century Fox presentation, where he showed colorful drawings to depict the overall feeling of the picture. It shows images of the dragon, Eragon, Durza's ring of fire, the Urgals (with horns), and Galbatorix. This collection of seven extra scenes includes several interesting storylines that might have added much-needed depth. Several involve the butcher's attractive daughter Katrina (Tamzin Egarton), who draws the eye of Eragon. However, she loves his cousin and is leaving the farm with him. The most intriguing new scene involves twins played by Ralph Brown who work with the Varden. Their test of Eragon's intentions reveals a sour political side to the apparently upright heroes. This complexity would have increased my interest and removed the story's all-too-familiar atmosphere. If you're interested in pronoucing the key locations and characters correctly, this is the feature for you. The series of pages also includes words from the ancient languages of the dwarves, elves, and Urgals. These two sections include drawings of both filmed sequences and ideas that were not part of the movie. Unfortunately, the images are way too small and need more space to offer a clear picture. The original storyboards cover six sequences, including Brom's tale, Saphira hatching, and the battle in the sky. Fangmeier created a "movements bible" to assist the animators while working at their desks. This brief feature includes drawings used for the creation of the complex Saphira. The director provides audio comments explaining the bible and describing the development process. Whew. I'm getting worn out watching all these extras. Amazingly, we still have a few more items to see before the end. In this interview, the author describes the basic elements of the plot for the follow-up book. Eragon's cousin and the butcher's daughter play a key role, and we meet some new dragons. The story sounds very standard for this type of trilogy, but I can only speculate on its actual quality. It's interesting to note the widely divergent levels of excitement generated by these two previews. The teaser includes no dialogue and is effectively cut to present the best action scenes. In fact, it's edited much better than the completed film. I can totally understand viewers wanting to see Eragon after watching the teaser. On the other hand, the theatrical trailer includes Jeremy Irons' narration and does not inspire much excitement. We see nearly every line delivered by John Malkovich in hopes of drawing crowds, but the overall result is not successful. I'm not a big fan of this type of feature, which is basically just an extended commercial for a video game. Fangmeier joins the creator and speaks a bit about the film, but the duo's comments seem oddly disjointed and don't flow together at all. It's very strange to find this prominent feature as the last available supplement on this disc. Focusing on visual effects, it includes 19 featurettes covering every single aspect of the production. You may watch them individually or view the segments together as a single documentary. Visual Effects Supervisors Michael McCallister and John Vanviet offer audio comments over numerous impressive shots presenting the effects' creation. These details are excellent if you're interested in going much deeper into this topic than in previous extras. The information provided here is some of the best on the entire release. Eragon concludes with an obvious set-up for a sequel, which was almost certainly planned during this production. Before developing another Inheritance Trilogy film, I would recommend that the producers choose a new writer and director. Another suggestion would be to cast several heavyweight actors for any new roles. Improved screen time for Hounsou and Malkovich will probably help, but I'm guessing it will not be enough. The fans were not happy with this adaptation, and there's no guarantee they will return for a sequel. This film represents a wasted opportunity for a top-notch fantasy picture and should be avoided unless you're a genre completist.